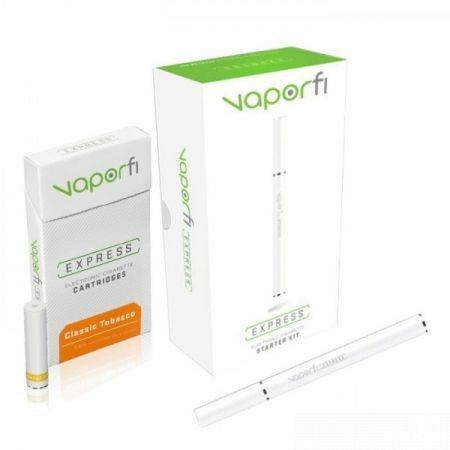 The new kit is called VaporFi Express Classic Tobacco and comes with two batteries (180mAh and 280mAh), five cartomizers, a USB charger, a wall adapter and the user manual. VaporZone is the newest brand from International Vapor Group, the same company responsible for a number of great e-cig brands such as South Beach Smoke and EverSmoke. It’s the kind of brand that specializes on looks, accessories and taste and offers highly innovative, sleekly designed electronic cigarettes, mouthwatering eliquid (made exclusively in the US) and plenty of other accessories to go along with their ecig starter kits. All of VaporZone’s starter kits look like they have been crafted inside a NASA research facility because their design is very futuristic and the quality level is above most other ecig brands it’s competing with. From their cig-a-like ‘Express’ starter kit to the more advanced personal vaporziers like the ‘Rebel’ this is the kind of brand that addresses mostly to the more experienced of vapers but they don’t discriminate. They sell their e-liquid separately and there are a lot of amazing flavors to choose from. They do not sell any disposables though, but that’s not a drawback since they address the more mature vaping audience. VaporZone knows that first impressions are important so they have invested a lot in the looks and presentation of their products. The Pro Starter Kit comes inside a slick white box with green tops and the design is impeccable. It’s made of thick cardboard and you can clearly see the logo and a photo of the product on top of the package. Inside you will find the battery and accessories nicely packed and putting it all together doesn’t take long even without reading the manual. They build quality is outstanding and the device feels very comfortable in the hand. The Pro was designed to address some of the most common flaws found in other e-cigarettes and replace them with a more functional model. The result is a very powerful e-cigarette, with no shortage of killer features. The Pro Starter Kit is available for $49.99 and it comes with a 30 day money back guarantee and a 90 day full commercial warranty. You can read about terms and conditions on their website. The 92mm long battery that comes inside the Pro Starter Kit is truly impressive. While only available in black, this manual battery packs a lot of charge and it’s rated at 650mAh. This battery, after first and full recharge, will give you 18-20 hours of vaping pleasure. And this is a lot compared to those standard cig-a-like batteries that give you anywhere from 1.5 to 3 hours. You do have the option of buying extra batteries and this time there are a lot of available colors to choose from. You also can opt for a high capacity 1000mAh model and even for a variable voltage battery for the most experienced of vapers. As you might expect, vapor production is at its best with excellent throat hit and amazing flavor. So if you are looking for something reasonably priced and that offers some thick clouds of white heavenly goodness then this might just be the device for you. If VaporZone managed to impress you with the Pro Starter Kit, just wait until you check out all of the e-liquid flavors. Made in the USA with high quality ingredients, they offer a wide variety of cocktails that are going to leave your mouth watering: Strawberry Cheesecake, Candy Crush, Blueberry Cheesecake, Choco-Nut, Fancy Latté, Real Cuban Mojito, Mango Cheesecake, Creamy Menthol Latté, Totally Toffee Tobacco, Creamsicle, Sweet Tobacco, Key Lime Cheesecake, Choco-Nana, Cuba Libre, Lemon Apple, Rum N Cherry Cola are just some of the names with a nice sweet vibe. All of them come in 6 different nicotine levels (0.0%, 0.6%, 1.2%, 1.8%, 2.4% and 3.6%). With a wide variety of starter kits for any taste or level of experience, endless range of high quality USA made e-liquids, reliable customer service and excellent presentation, VaporZone is going to become one of the key players on the ecigarette market in the near future. Their Pro Starter Kit offers great value for money and it’s a great option for both beginners and experienced vapers. You won’t be disappointed by your purchase if you decide to go with the Pro.